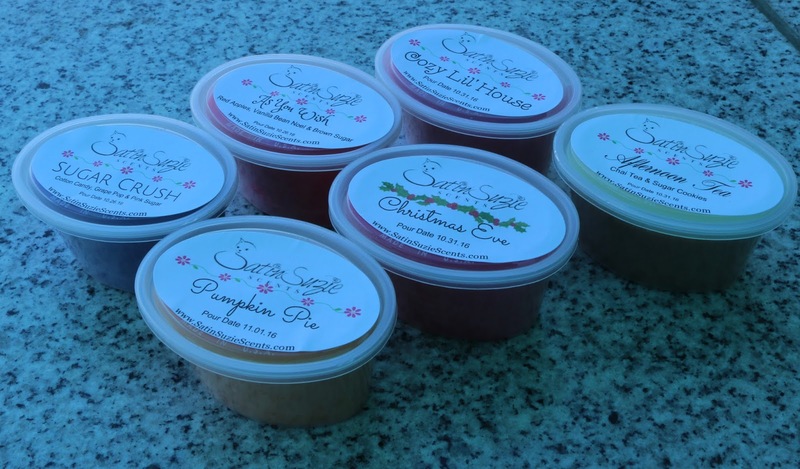 Satin Suzie Scents is a parasoy wax company that provides both RTS and custom products in a variety of scent options. Her scent selection is expansive without overwhelming the buyer and boasts a great variety of house blends. 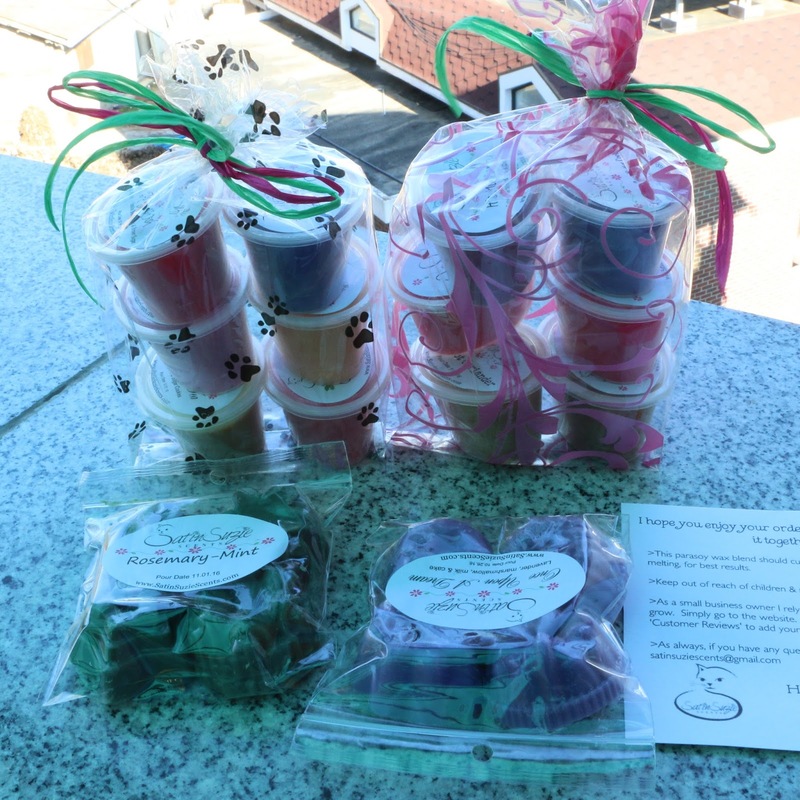 Her prices are comparable to other vendors, with RTS scent shots running at $1.60 ($1.70 if you go custom), $3.65 clamshells, and $3.00 Flower Packs, which come with four tarts. Shipping is a flat rate of $7.00, and Bernadette refunds any shipping overages over $1.00. Unfortunately she does not ship internationally at this time. Right off the bat I was very impressed with the presentation. Bernadette has found a nice balance between aesthetic and practical with the packing peanuts, tissue paper, neatly tied & bagged scent shots, and a thank you card with handwritten note on the front. The labels are clean cut and easy to read. They include the blend/scent name, a pour date, and scent notes if it's a blend!! I cannot tell you how awesome that is and how much I want that in wax I order! Let's get onto the wax itself, shall we?? Sugar Crush: Cotton candy, grape pop, and pink sugar. Sweet, grapey goodness with just a hint of fizz. I'm a fan of the way this eats into my teeth and settles around my gums. I'm so glad dentists exist in today's world. My teeth thank them every day. As You Wish: Red apples, vanilla bean noel, and brown sugar. Crunchy apples drizzled in caramelized sugar with just a hint of that signature VBN. Cozy Lil' House: Sugar and spices, with notes of apples. 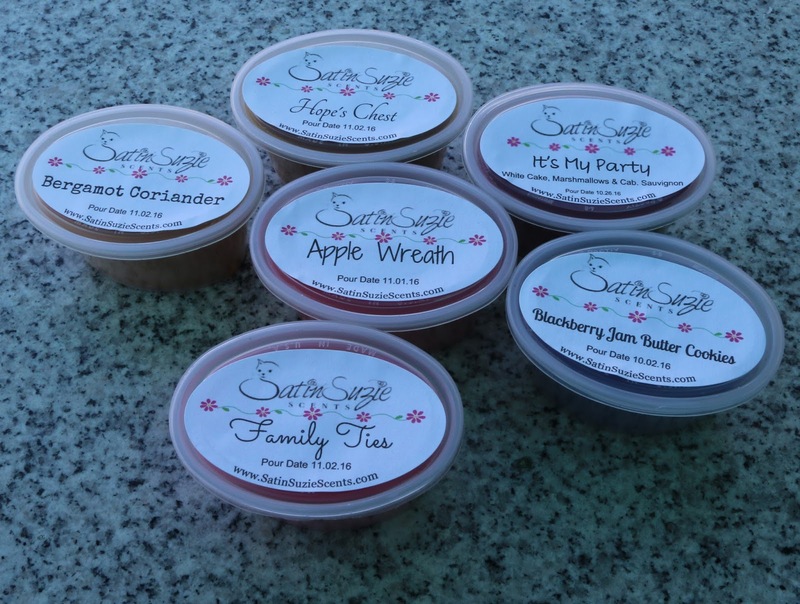 Every vendor needs a sweet cinnamon & apple scent, and Satin Suzie Scents is no exception! The cinnamon leans towards a honeyed note, while the apples stay sweet and ever so slightly crunchy. Pumpkin Pie: Thanksgiving. Pumpkin, spices, butter, sugar with hints of vanilla. 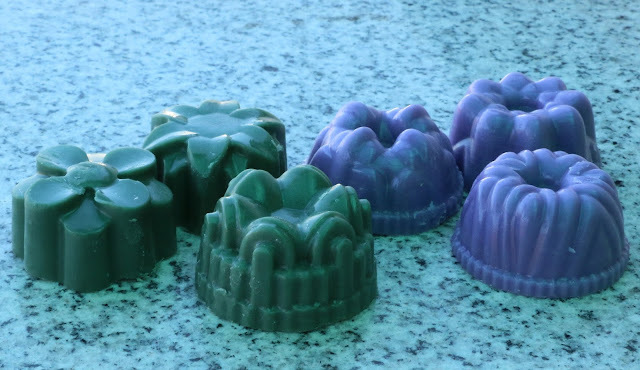 Jeez, maybe this is the wax I should have melted when we had our Thanksgiving get together! On cold sniff I get a healthy dose of bready pumpkin pie with just a hint of spicy vanilla. The strongest note is the woody pine, with just a hint of something citrusy (probably from the pine). In the background, slight nutmeg and cinnamon dance around. Side note: how cute is it that the label for Christmas Eve has a little holiday appropriate flair to it?! Afternoon Tea: Chai tea and sugar cookies. "Well had one, yes. What about second breakfast?" "Don't think he knows about second breakfast, Pip." "What about elevensies? Luncheon? Afternoon tea? Dinner? Supper??" I can't help it. The Lord of the Rings is a lifestyle, not just a movie trilogy. Now excuse me while I prance off to YouTube to listen to the 10 hour remix of "Taking the Hobbits to Isengard." Back on track, this blend smells mostly of sugar cookies. There is an ever so slight hint of tea on the first exhale. It takes a few more sniffs to really catch the tea, but once you do it's a glorious mixture of the two. Bergamot Coriander: Clean, fresh & relaxing. Soft notes of bergamot and undertones of coriander. Michael. If you ever want to know what my husband smells like, take a ginormous whiff of this and imagine you're nose deep in his 'pits. Alternatively, you could think of something clean, fresh, and relaxing. The coriander is strongest here, but the bergamot definitely makes its presence known. Definitely not for everyone, but for those who are fans, this is a gorgeous blend. Hope's Chest: Fresh woody scent of cedar with notes of cinnamon applesauce and gingersnap cookies. This is very light on cold sniff. It's mostly applesauce and gingersnap cookies. There are faint notes that hint at musky cedar, but it's hard to be certain. I look forward to what this intriguing blend has in store once melted! It's My Party: White cake, marshmallows and a glass of cabernet sauvignon. Strongest is the wine, with a pleasant backdrop of marshmallow infused cake. Lacks the tart aftertaste of wine, but still hints ever so delicately at booze-ladden girls' nights complete with chick flicks and painted toenails. Sign me right up! Blackberry Jam Butter Cookies: Fresh baked butter cookies with a dollop of tart blackberry jam. Smells like a typical BBJBC blend. Sweet cookies mixed in with some juicy jam. Family Ties: Fresh wild berries, pomegranate, red currant and grapefruit mingle with vanilla and marshmallow and a touch of musk. A tart, berrylicious blend with vibrant notes that wake up the mind. Just a hint of musky vanilla. There might be some creamy marshmallow, but it mixes with the rest so evenly it's hard to pick it out individually. Apple Wreath: Dried fall apples mingle with spicy cinnamon, cloves and light balsam. Rosemary Mint: Clean blend of fresh rosemary with refreshing mint. Stroooooong rosemary smashed together with stroooong mint. A fresh, in your face blast of wake-up-it's-time-to-start-your-day! I don't know whether I want to throw this in my mouth and chew it like gum or throw it in a hot bucket of water and mop the floors with it. Once Upon A Dream: Lavender, marshmallow, milk and cake. Herbal lavender mixes itself into some marshmallow cake with just a hint of that metallic bite. Who would have thought herbal lavender mixes so pleasantly with bakery?? I'm very happy with this wax and its performance. Stay on the lookout for some more in depth reviews of each scent here, and if you haven't already check out the Black Friday Christmas Sampler sale she's currently offering. 10 scent shots for $15? Sign me right up! Have you tried Satin Suzie Scents before? What scents are your favorite, or look to be right up your alley? Nice scents! I am impressed with Satin Suzie's wax too. The lavender cake one was very yummy. I will have to try the rosemary mint next time. Hey!!! Your blog is so cute!!! Your header is so cheerful. I love it. You ordered some samplers right? I cannot wait to get mine.